Mobile Web Server can make you access your phone features and data via a browser. It makes your device easily accesible on the Internet. You can even start a personalised mobsite with this Mobile web server. Group Calendar Widget is a small widget that allows you to have a live access to your friends' device calendars. With Mobile Site Widgets you can view the contents of your mobile phone and initiate certain operations like SMS sending or call initiation over a secure HTTPS channel. With Facebook application,Live Status from my Nokia Phone you can choose to show your status, location, calendar availability and whether you are having a call or not at the moment. 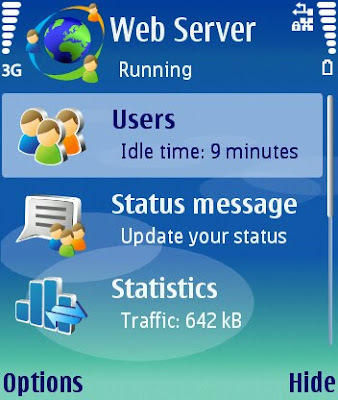 Download Mobile Web Server for your phone.